New Year’s Eve was a lot of fun. I was worried because most of my tentative New Year`s plans fell apart at the last minute. Fortunately I was able to join a group of Hello House people and friends on their way to O’Carolan’s Pub in Jiyugaoka. We got to the pub just in time for the big Bob Sapp vs. Akebono fight. 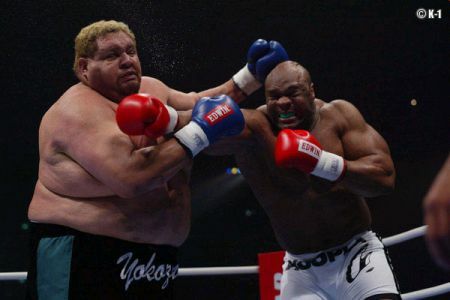 I have written about Bob Sapp before, but Akebono was a retired sumo champion who had a little trouble with the transition to MMA. Sapp won quickly and then challenged Mike Tyson to a fight. We had beer and did the big New Year’s countdown, but it just wasn’t the same away from home. After O’Carolan’s we went to a karaoke place in Musashi-Kosugi. Our group got a private karaoke room that rated your singing at the end of each song. My “Daydream Believer” got a whopping 78 points, which left me in first place until Katsuragi racked up just over 80 points on the last song of the night. Stupid Katsuragi! Overall it was a fun New Year and I ended up getting home around 3:30am. This entry was posted on December 31, 2013, 8:00 pm and is filed under Drinking, Karaoke, Life in Japan, Tokyo. You can follow any responses to this entry through RSS 2.0. You can leave a response, or trackback from your own site.